46 cars means that both the Carsport Callaway and S-Berg Racing teams have so far been unable to confirm a third car (Corvette Z06 and Lamborghini Gallardo respectively) whilst it appears the JMB have had no takers for the prospect of pedalling a Venturi Heritage. GPC meanwhile have entries for a trio of Maseratis but have so far named none of their drivers. So eight marques it is, with Ascari, Aston Martin, Chevrolet, Dodge, Ferrari, Lamborghini, Maserati and Porsche all represented. 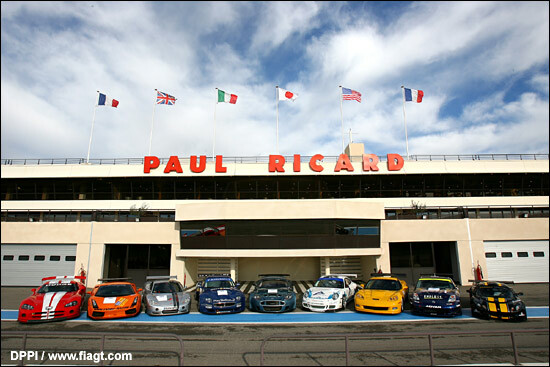 On the driver front there are a few surprises – Anthony Reid pops up in a Pouchelon Racing Viper, one of at least five drivers on the entry who have previously had factory drives at Le Mans (together with Klaus Ludwig, Tiff Needell, Ben Collins and Richard Stanton). LMES 2004 GT1 Champion Steve Zacchia will race a Viper for the Racing Logistic team. Beyond that it’s a case of “Spot where they used to race” and there is an inevitable conclusion that many have defected from one or other of the European domestic series - the number of Italian drivers seemingly a telling pointer back to the depleted grids of their home GT Championship. Tech 9 of course has chosen to compete on the international stage this year, in preference to a defence of its British Championship title, and the entry list gives final confirmation of the three driver pairings. Also confirmed is the line-up for Damax’s interesting Ascaris. There is a single seat to fill alongside Luca Pirri in the #47 car, but the combinations of Ben Collins and Nick Adams, and Aaron Scott and Richard Stanton, should see the silver cars up in the leading action. The only other entry that could reasonably be described as having chosen the FIA series over the British is the JMB Ferrari 430 of Hector Lester and Allan Simonsen, this pair having shared Lester’s Ferrari Cup Class 360 for a couple of seasons in the UK. Former domestic front-runners Jonathan Cocker and Piers Johnson will both be aboard (different) Barwell Aston Martins. There are familiar pairings from the ‘big brother’ FIA GT Championship too, the Bryner / Calderari pair staying with BMS Scuderia Italia, but stepping down a couple of classes to a GT3 Aston Martin. Other ‘returnees’ include the pairing of Berhnard Muller and Michael Trunk who shared a variety of Porsches and Lamborghinis in the FIA GT Championship between 1997 and 2001: they will share the #15 Reiter Lamborghini.